Previously in Stick Cats: Eating the Catnip Rose the gave the Cats the ability to locate the Octo-Kitty in the Litterbox Desert... but is there enough time to save the Manx Militia from certain death??? Special thx to Katie Henderson for drawing the first panel of this comic, helping me successfully transition the Stick Cats back to their normal forms. If you've been following Stick Cats, then you may have noticed that it keeps slipping later and later into the week (from Monday to Wednesday to Thursday to Thursday night). THAT STOPS HERE! 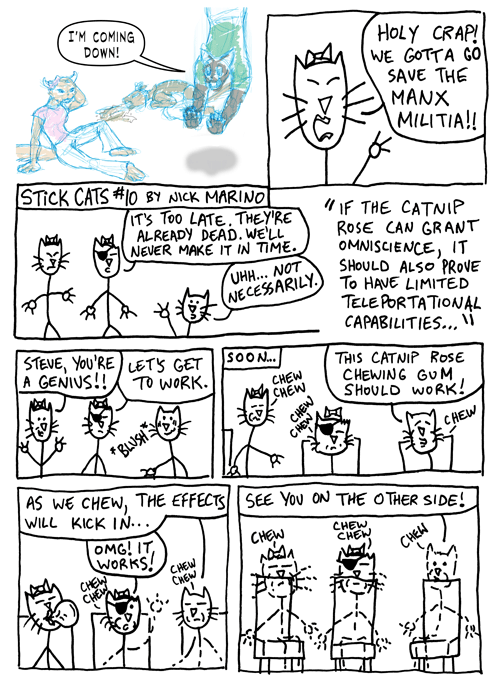 In fact, I'll have a Stick Cats pinup posted in a couple of days, and then #11 will be posted early next week. I haven't decided it yet... but I'm even thinking about doing more than one Stick Cats a week (not like anyone really cares, but I might do it anyway).